Gentle Giant, Ltd. has designed an awesome 6 inch tall bust of the Marvel Comics anti-hero Deadpool that functions as a pencil or pen holder for your desk. It is available to pre-order at Gentle Giant, Ltd. and Entertainment Earth. Ooh… that’s got to hurt. Here’s your chance to take a poke at Deadpool! 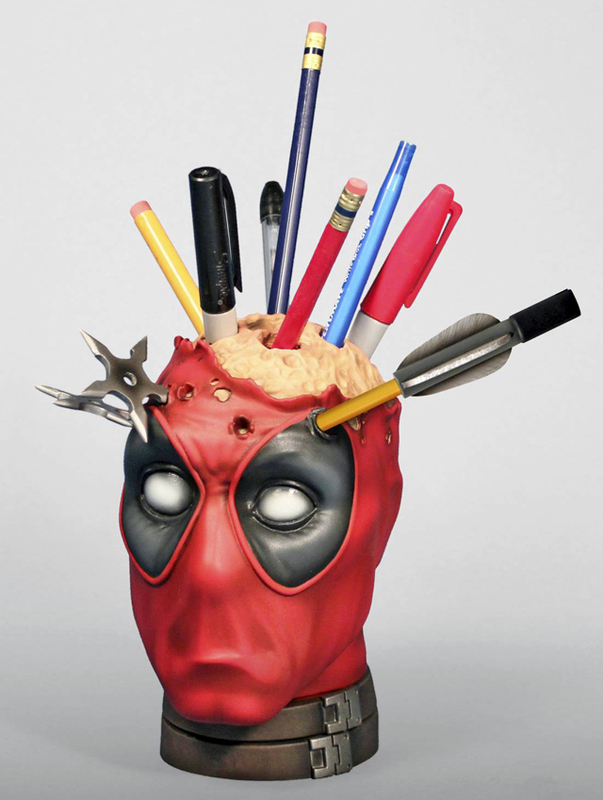 Inspired by the violent and comedic mutant anti-hero Deadpool (Marvel’s incredibly popular “Merc With a Mouth”), the Deadpool Pencil Cup kicks off Gentle Giant’s line of exciting Marvel desk accessories. And it’s sure to be a conversation starter! Cast in high-quality polystone, this unique 6-inch tall piece comes with two shuriken-shaped erasers and a soft-plastic arrow fletching cap so you can “weaponize” your favorite pen or pencil. Stick it to him!